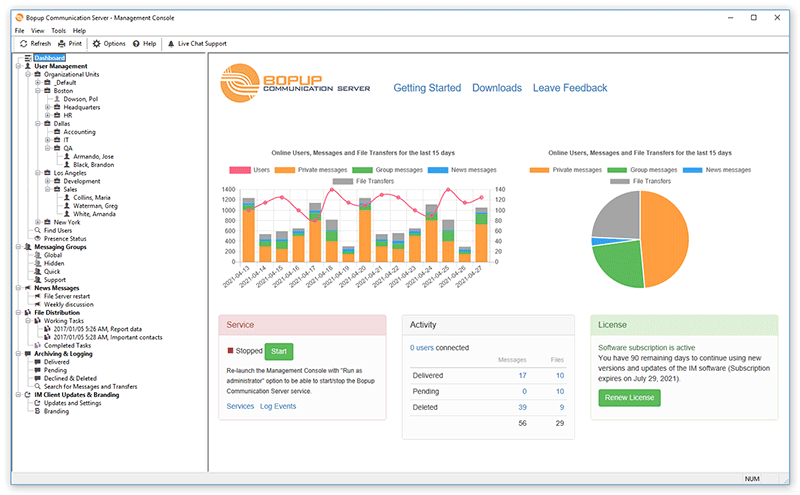 We released new version 5.4 of Bopup Communication Server software that has great changes and improvements. The new version has changes in it's internal IM service that accepts and handles network connections made from users' messaging clients. The most important news that now the communication server can support up to 3,200 concurrent connections from Bopup Messenger and Bopup Observer clients. Previous value of 1,600 concurrent users was hard-coded in the software. We believe that now the IM server is ready to be used in large corporate and private networks. There are a lot of improvements and enhancements we made in the service module that handles all users' connections over network. The service could hang or stop accept new connections from the messenger clients at some time so we reviewed and rebuilt it's source code to avoid all possible issues and problems. It works now faster, better and should take a smaller amount of computer RAM. The function to automatically search and import user accounts from Active Directory include important fixes. It did not import users if non-default account is used by the function to connect to the AD catalog. Now the service module writes information, warning and error messages to Event Log in Russian language if it is running on Russian version of Windows system.